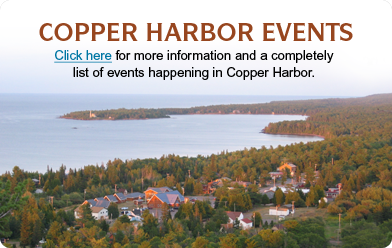 We’re centrally located in the heart of Copper Harbor, Michigan and only two blocks away from exquisite Lake Superior. Built in 1938, this historic resort has everything you need for a perfect stay in the pristine air and surrounding wilderness of the Keweenaw Peninsula. Stay in one of our cozy log cabin cottages or chose a deluxe motel room, shop in our Thunderbird gift center to find unique gifts for yourself or family and friends, then slip back in time on a tour of our Astor House Museum (open July through September). Our family hosts Spirit of the North Wellness Center. Located on the main grounds, the center offers massage and wellness treatments, yoga, lectures and workshops. We also specialize in pre-wedding parties and events. For more information or to schedule a service visit www.spiritofthenorthwellness.com. We’re located steps away from dining, shopping, ferry tours, world-class mountain biking, golfing, massage therapy, hiking, fishing, swimming, rock hunting, minigolf, local berry sundaes and much more. The adventure is up to you, and we’ll be ready to welcome you home. Come stay with us to experience the past and feel the serenity of the present. The resort hosts lodging guests May thru October. To reserve a cottage or room, please choose from the options below. tours and times click here.